Incheon （인천 仁川） port is located near Seoul City. 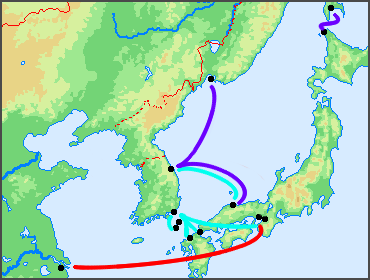 Many ferry routes link between Incheon and China, especially for ports in Shangdong Peninsula and along the gulf of Bohai. Dandong is near to border of China – North Korea. International passenger ferry terminal located at Donggang （东港） City, is about 50km away from the center of Dandong. You can check through fares from Dandong on their website at the Tariff in RMB. Reservation: Online booking is not available. Call their office in Incheon 032-891-3322, in Dongang 0415-3152666. Dalian is hub port of domestic passenger ferry crossing of Bohai, also connecting with yantai （烟台）,Weihai （威海） and Tianjin （天津）. Dalian: Check-in time 14:30-15:30 from January to June, 14:30-16:00 from July to December at Passenger Ferry Terminal. Reservation: Online booking is available, but in Korean page form. Contact with 032-891-7100(phone) 02-3218-6501(fax) in Korea office. Yingkou is the nearest sea port 170km away from Shenyang （沈阳）. Bording at 8pm on Tuesday, leaving at midnight, arriving at 3am on Thursday, landing at 8am. You can reach Shenyang within three hours use vehicle, taking taxi and bus after landing. comment from Anonymous traveled on March of 2014. Qinhuangdao is about 280km away from Beijing to the east. You can travel to each city by a limited express train for four hours. Reservation: Online booking is available, but no English page. Passenger service center in Incheon 032-891-9600(phone),in Seoul 02-794-8811(phone) 02-797-8801(fax). International ferry terminal is located in Binhai New Area (滨海新区) of Tianjin, is 60km away to the east from the center of the city. Charges & fees: Economy 115,000(KRW) 888(CNY) Business 130,000(KRW) 1,005(CNY) Deluxe 160,000(KRW) 1,236(CNY) Royal Suite 250,000(KRN) 1,590(CNY), Fuel Surcharge: 10,000(KRW)60(CNY), Departure Tax: Incheon 3,200(KRW). Fares in Chinese page and in Korean page. Reservation: Contact with their office in Incheon 032-777-8260(phone) 032-777-8267(fax) or a travel agency, their list page is here. Yantai is located in northern Shandong Peninsula, has good connections to Dalian （大连） by sea, to Jinan （济南） and Qingdao （青岛） by road. Reservation: Online booking may be available, but in Korean language only. Contact with their office in Incheon 032-891-8880(phone) 032-891-8881(fax). Weihai is about 70km to the east of Yantai, frequent intercity bus links the both city. Reservation: Online booking is not available, but you can refer to information in English pages. Shidao is the eastern Shandong Peninsula is well known for scenic resort place in China. Reservation: Contact with their ticket office in Shidao 0631-728-1666(phone) 0631-728-6221(fax), in Incheon 032-891-8877(phone) 032-891-5599(fax). Weidong Ferry also offers ticket to Qingdao. Reservation: Online booking is not available. See useful English pages on their website. Lianyungang is connecting point with sea and trains leaving for Beijing, Wuhan, Guangzhou also Urumuqi. Charges & fees: First class 130,000(KRW) 780(CNY) Royal 155,000(KRW) 920(CNY) Royal Suite 220,000(KRW) 1,300(CNY) VIP 330,000(KRW) 1,950(CNY), Fuel Surcharge: 20,000(KRW) Departure Tax: Pyeongtaek 4,300(KRW) Lianyungang 30(CNY). Reservation: Contact with their office in Incheon 032-770-3701 (phone) 032-770-3758(fax), in Lianyungang 0518-8238-8168(phone) 0518-8238-8935(fax). Pyeongtaek (평택 平澤) is located in 70km to the south of Seoul. There are ferry routes to Shandong and Jiangsu Province. Yantai Ferry operates OCEAN BLUE WHALE between Pyeongtaek and Yantai. Reservation: Contact with 031-684-8827（phone) at Pyeongtaek office. Jiaodong Shipping operates GRAND PEACE(中达永安) between Pyeongtaek and Weihai. Dalong Ferry link Pyeongtaek and Longyan （龙眼） port at Rongcheng in Yantai City. the YONG XIA, Pyeongtaek – Rongcheng is stopped. RI ZHAO DONG FANG sails for each destination for 3 times crossing per a week. Reservation: Contact with their office in Pyeongtaek 031-684-3100 (phone) 031-684-3118(fax), at Lianyungang 0518-8238-8189(phone) 0518-8238-8935(fax). Gunsan (군산 群山) City is located in Jeollabuk-do province, it is about 90km away to Gwangju(광주) City, about 70km to Daejeon(대전). You can easily travel by a long-distance bus from both cities, also go by train from Seoul. Reservation: Contact with their ticket office at Shidao 0631-728-6666(phone) 0631-728-9399(fax), at Qingdao 0532-8602-1900(phone) 0532-8602-1901(fax), at Gunsan 063-441-1200(phone) 063-441-1270(fax). Gunsan International Ferry Terminal (군산항국제여객터미널)[map] is located near the Coastal Ferry Terminal (군산연안여객터미널) for domestic routes at a distance of about 9km from Gunsan bus terminal, about 15km from the train station. The local bus No.4,83,84 leads you to there from central. Sokcho （속초 束草） port that located in the northeast of S.Korea has ferry route to Russia. China does not have any coast along the sea of Japan, but ferry company offer travel tickets to Hunchun （珲春） via Zarubino port in Russia. Tickets are included the fares of Russia-China border crossing vehicle. You must obtain a valid Russian visa in advance. The ship, New Blue Ocean travels between Sokcho and Zarubino. After landing, you will ride in a vehicle to Hunchun. Is the Jinchon ferry Incheon-Tianjian still closed? Yes. Unfortunately, Jinchon ferry is closed now. We hope int’l ferry lines will be known widely and many people begin to try their services. Thanks! Excellent, pleasant post and also the precise product information, allow me to tell my local freinds throughout fb.